Look no further for a way to teach about the major environmental issues plaguing Africa today. 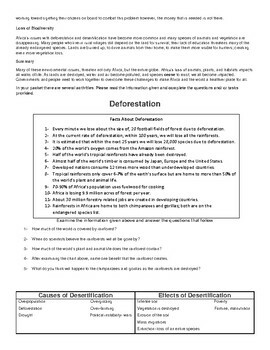 This packet tackles deforestation, desertification, and pollution in a way your students can understand. Included are 3 different levels to help all your students learn the material provided. 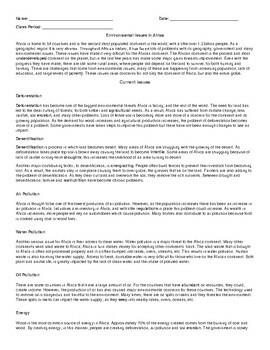 Students who require vocabulary assistance are provided with a glossary to help them better understand the material; while your higher students are provided with more critical thinking challenges to show what they learned. Based on the amount of material and how in depth you would like your students to answer this activity could span several days. 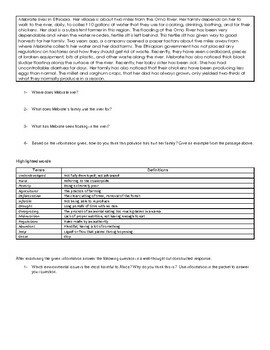 This activity is set up a in a DBQ style format with a constructed response given at the end of the activities.